Our next and last activity: Android port. 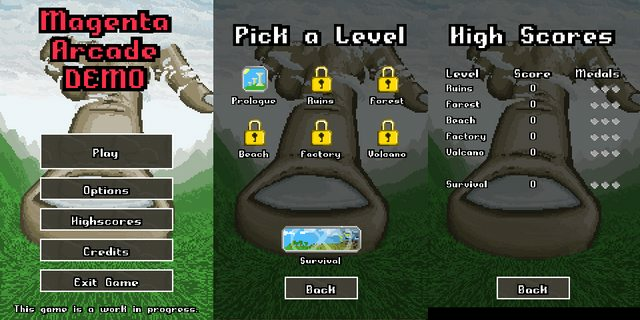 We might add some new stuff like Survival Mode and Global Highscores along the way. The game is called Magenta Arcade, it is an "old but new style" shoot'm up for iOS. In the screenies you can see there is no main character, the actual game character is you. That's where we believe we can be innovative in the game design. In the story, you are a kind of god that maintains your power by realizing wishes from your people, until our villain -Ivo- comes up with a wish that gives him the power to hurt you. 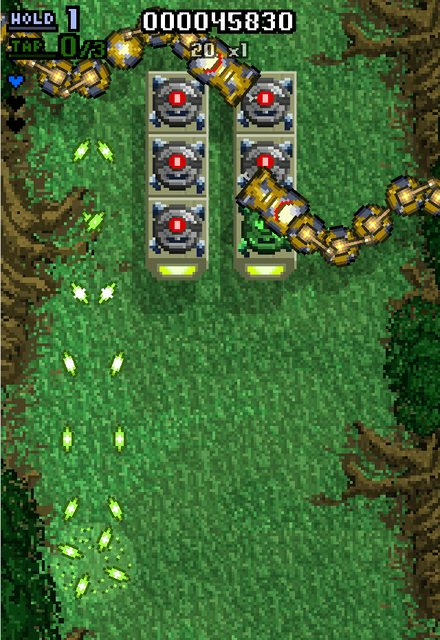 After being hurt for the first time, when one of Ivo's power touches your finger, you faint to only wake up some years later, when everything is on chaos, dominated by Ivo and his robot minions. 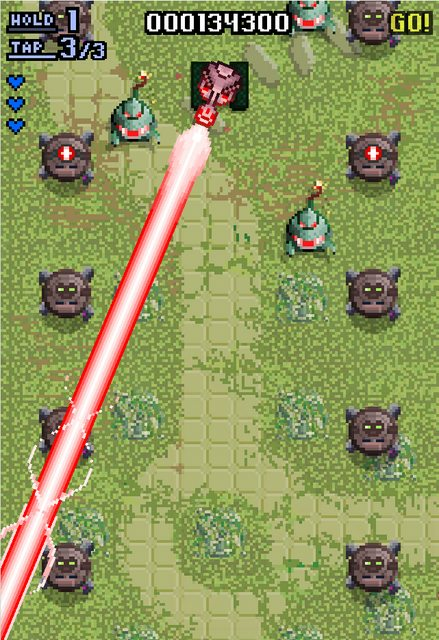 Now you have use the power (weapons) you gain from your peoples wishes to fight through the robots. When you put your finger on the screen, though, you become vulnerable to be hurt from Ivo's powers. The game has a sarcastic/humorist tone, it's name comes from Ivo's big "kinda Magenta" "black power" hair. Also, as we're from Brazil (and speak Portuguese as our mother language), it is nice that Magenta Arcade works in Portuguese as much as it does in English. There are 5 levels. Each level has from 5 to 10 minutes of gameplay counting the boss (Ivo reappears in the end of every level with a new challenge), but the player will probably need to try more than once to finish it. We're trying to make it so it's very hard, but not frustrating. The Long Hat House is actually a small team of two, we are Lucas Mattos (@rasomattos) and João Brant (@brantkings), from Brazil. This is our first game to be launched as Long Hat House. The music and sounds are being made by two other guys: Marcos Lima and Alexsander Souza. @longhathouse is @brantkings and @rasomattos. I'm one of the two developers of this game. We just paid the dev accounts for publishing at Google Play and App Store, which is awesome, feels like we're getting there! We are thinking about using their support for Alpha and Beta tests, but we are new to it, have any of you ever tried it? A friend told us about hockeyapp.com (they have 1 free month, which might be enougth for our tests), what do you think? Any tips or insights on that? Before that our idea was just to send an .apk by e-mail, but that would be impossible for iOS. The Google Play support for Alpha & Beta are fine. I couldn't really tell what it gave you besides just sending out an APK (I guess other people don't have to enable outside APKs?). So depending on how wide you plan on going for testing, I think just sending an APK is fine. A lot of people use TestFlight for iOS. It's more cumbersome - you as the developer have to get device IDs from testers and then add those IDs to your signing information in the iOS Dev Center. It's been a while since I've done it; they may have streamlined it some. Unfortunately, there's no way around it. Our use-case was a little different: we already had Flurry analytics in (including Flurry crash reporting), so we didn't have to rely on any device-dependent crash reporting. HockeyApp looks OK, but I've never tried it before. Hi bdsowers, thanks for the info! We will probably explore HockeyApp a bit, also it looks like TestFlight had some improvement in the ID problem.. Something we're worried about is how easy it is for the tester to use it. Sending an APK requires users to download it, connect their phones, enable outside apks, and install it. It is not hard, but not everybody would do it. And asking people for their UDIDs (iOS) sounds just as problematic as the apks thing. Putting together Android and iOS tests in the same place also sounds prety nice, although any thoughts on that would be very welcome! Hi guys, here is some update! 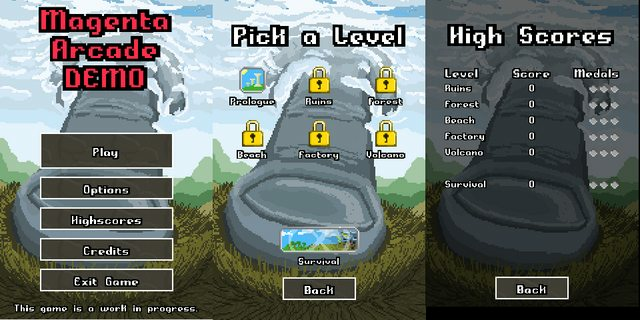 I reworked the menu screens a bit, we thought about the background being a huge finger that comes from the sky, this finger represents the player finger, from the point of view of the enemies. I think it got better (since it was awful before), but I feel like the finger still needs some work, I just can't tell what it is. Also ideas for the buttons (or any other thing) would be welcome! I tried many colors and combinations for them, but they just dont look right. Hello all, I'm João Brant and I work on Magenta Arcade with Lucas. So far, we are reaching the end of the game in terms of content. We feel that we should have posted something here waaay before, and we won't do that mistake again. We need some input. Tell me what you think, do you think the red shots will be hard to see in some of them (especially the lava-filled one)? That's a recurring problem we've been having. We will use Google Play's and App Store's solutions for beta testing, turns out it looks like the easiest one for the testers. At least they can download the game directly from the market places. If any of you would like to test Magenta Arcade just fill out our form, we will be launching the tests soon, probably in a week or so. Then we'll send you an e-mail with instructions =). Here is how Magenta Arcade looked like when we were like 3 weeks into development (and it was called Sky Link). It can give you more of an idea of how Magenta Arcade's gameplay works. Don't forget to turn on captions. I dig the art style and idea of no main character in a mobile shooter! Thanks dude! We need as much feedback we can, I guess. We just begun the tests, you should have received an e-mail by now. If anybody else want to check out the tests, it is always possible until the game's launch (probably in the end of this month) so go ahead to www.longhathouse.com if you want. We're certainly not done with Magenta Arcade, we are still planning some more stuff for the people who bought the game. Like, for example, survival mode and global highscores, so there's still some dev work to do. But yeah, we launched it! If you like it, you can find a link to the app store in the OP's post. Yess! We launched it and it feels great. In the end I think the game provides quite a tough challenge, which was our initial desire. I would like to hear from people who finishes it's last level.. true heroes! We had fun developing it, and dedicated our body and souls to make it the best game we could. As João said, we still have some plans for the future, an Android version might come, global highscores and survival mode are a possible update also. For those from TigSource who might have interest, the game is for $1.99 on App Store. Thanks a lot for those who helped us, mainly during the beta tests!